Olivet College’s insurance and risk management program is one of the best in the state, and as graduates enter the professional world, there’s no doubt that the program is having a profound impact on its students. Because of the broad knowledge professors share with students, they learn an abundance of professional skills along with the skills they develop in the classroom. Insurance and risk management majors receive personal assistance in building their resumes and preparing for a career in the field. Corey claims that she fell into the career, but she’s more than happy that she did. She also feels well-prepared to enter the professional world. Professor Humphreys echoes the importance of internships as part of the curriculum. Another way Olivet is grooming young professionals is by partnering with Farm Bureau Insurance to provide an insurance program for high school students. 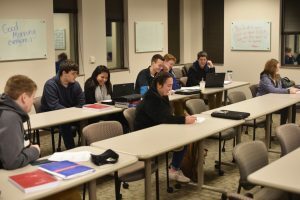 According to adjunct professor and program instructor Greg Brown, the class gives students a head start on their career. Junior Phillip Hawes started his insurance education in the high school program and was immediately inspired. He stresses that the class solidified his original interest in the industry. With many people retiring from the insurance industry within the next few years, Corey expresses the importance of getting involved in the field. Phillip plans to become an excess and surplus lines wholesale broker after graduation. He sees it as a way to meet new people and build relationships. He encourages those interested in insurance to promote innovation. To learn more about Olivet’s insurance and risk management program, contact the Office of Admissions at 800.456.7189 or admissions@olivetcollege.edu.